The book that has made more saints than any other, after the Bible. Countless saints from Therese of Liseux to Ignatius of Loyola have kept this book on their nightstands, used it to direct their minds during adoration, and carried it in their pockets as a soldier carries his weapon into battle. - Pocket size: Perfect for purse, pants or jacket. 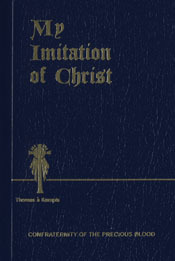 Having this book on your person reminds you to imitate Christ always – without exception. - 117 Illustrations: With seemingly miraculous power, Ariel Agemian’s timeless depictions of modern man (in suit and tie) carrying his cross, tempted by Satan to vain pursuits but called by Christ to eternal life. Your soul will be forever imprinted by an image of man’s attempt to be in the world - but not of it. - Durable Flex Cover: far more resilient than your average book. If you use this book properly, it will take a beating. - Reading Guide: In the back, 42 practical topics with references to guide you through your spiritual reading. Ex. : “Are you discouraged? Read Book III, Chap. 56” “Are you vain? Read Book I, Chap. 2, 7.” With over 40 of these, you’re bound to find yourself somewhere. - Index: Not your everyday index. Hundreds of topics with every reference in the book cited. Here are your answers to nearly every spiritual issue – if you use it. If you wish to be in the world, but not of the world, there is no better edition of this timeless classic than My Imitation of Christ. Thomas a Kempis was born at Kempen, Germany, circa 1380. After joining the monastery of Mount St. Agnes in 1406, he received Holy Orders seven years later, and thereafter busied himself with prolific writing and copying work. His books include the well-known Imitation of Christ, Life of Geert Groote, and Life of Liduina of Schiedam, the latter of which he epitomized. He also possessed an earnest love for the poor and Holy Scripture. Thomas a Kempis died on the twenty-fifth of July, 1471.